Bangkok Day 3 – Why are Thai girls so tiny? I have to admit, I wanted to go to Chatuchak because people kept talking about how cheap the things were. 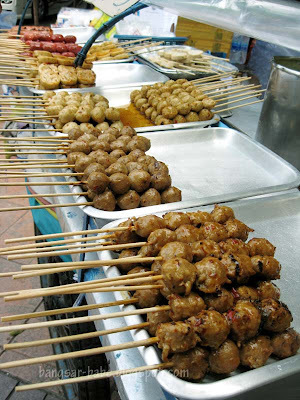 That Saturday, we left for Chatuchak pretty early in the morning (excited ma), and reached the market at 9.30am. Chatuchak opens during the weekend from 9.00am to 6.00pm, and the best way to get there is by taking the Skytrain – stop at Mo Chit. The market is divided into areas depending on the types of goods sold, and because they were out of maps, I found the place confusing. Chatuchak was insanely hot and humid, and was by far the most uncomfortable shopping experience for me. 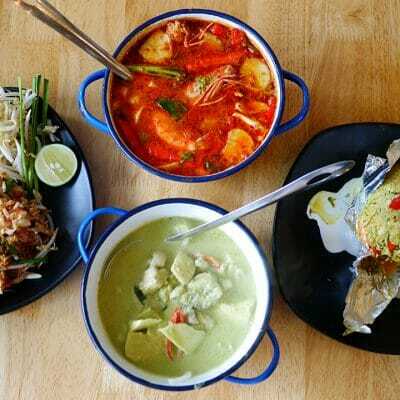 If you enjoy shopping in the comfort of air-conditioned malls and don’t have much tolerance for heat, then Chatuchak is definitely not your place. Wear light clothing and drink lots of water if you still want to check the market out. Frankly, I found Chatuchak quite disappointing in the sense that most stalls were repetitive and some things were not cheap. Some of the things were nice, but most of them had poor workmanship. I’d rather go to Platinum Mall. At least the shopping mall is clean and cool with neatly displayed merchandise. 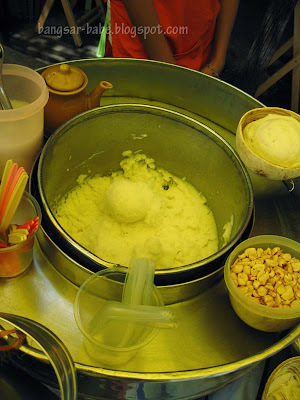 rif and I got ourselves some coconut milk ice cream (25 baht). 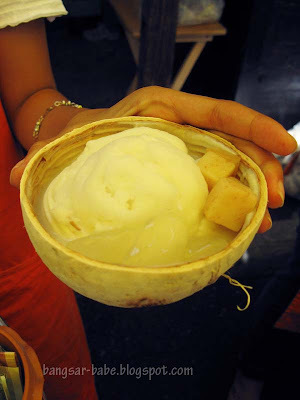 Served in a coconut bowl, it had a smooth texture, and was light, milky and fragrant. 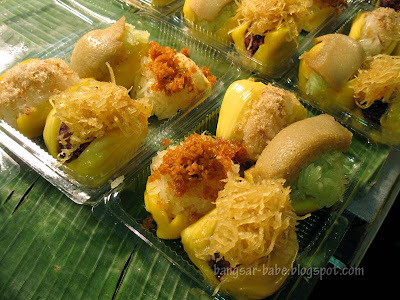 However, I’ve tried better ones from the Thai bazaar in Penang. I ate my ice cream with sweet potato cubes and palm fruit. You also get a free cup of coconut water to go with your ice cream. It was so hot, I got myself two cups to drink. 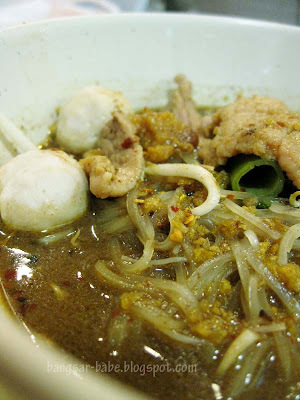 Lunch was green curry noodles (40 baht) from a nearby stall. I looked around and saw the other patrons eating their noodles with the sauces and vegetables provided at the side, so I followed suit. The noodles came with chicken pieces (with the skin intact), brinjal, sliced red chili and coagulated blood. Tastewise, the noodles were not bad, but the portion was ridiculously small! 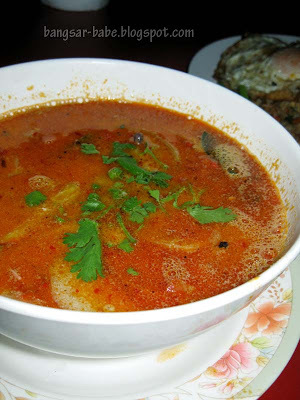 The curry was spicy, definitely spicier than most of the curries I’ve tried – I was sweating by the time I finished my food. 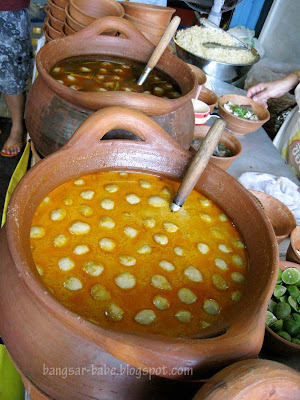 Apart from the heat, the curry had a distinct sweetness and creaminess from the coconut milk and brown sugar. 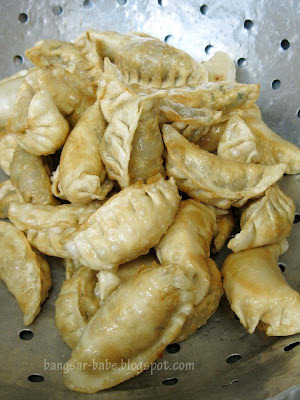 We also ordered some gyoza (35 baht) to share. Nothing special, I found this too sweet for my liking. 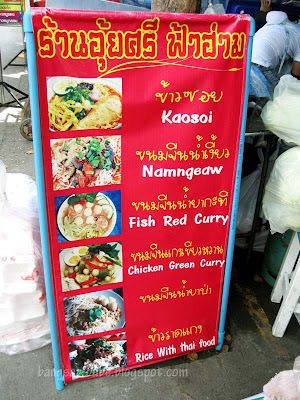 A lot of people mistook me for a Thai, and there was this one food stall at Chatuchak who gave me a Thai menu. 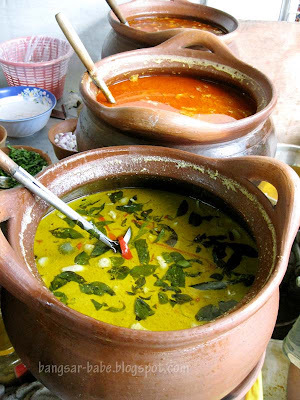 When I told them I wasn’t Thai, they gave me the English menu, and the Tom Yam Kung went from 50 baht (locals) to 90 baht (tourists). Needless to say, I didn’t eat there. 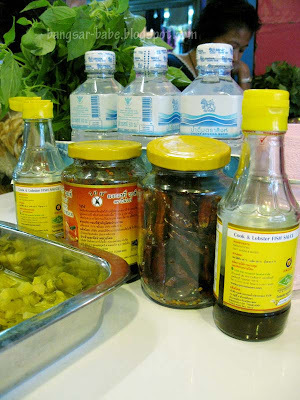 By noon, we left Chatuchak and went to Platinum Mall – I had quite a few things to buy there. Thai girls were so small, I had to wear a size M for some clothes. We were quite hungry by the time we were done shopping, so we settled for dinner at the Platinum Mall Food Court again. But this time, we ordered different things. 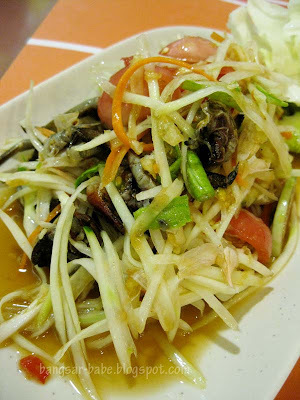 I tried the som tam with baby crabs (40 baht), and didn’t like it one bit. I thought the crabs tasted awful. They were slimy and foul-smelling; I fished them out and tossed them aside. rif got a bowl of beef noodles (40 baht), which I enjoyed, but not as much as I enjoyed the one from the stall along Sukhumvit 11. 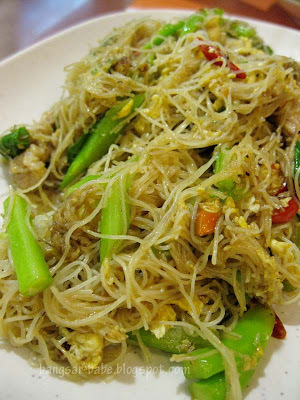 I liked the Thai Fried Vermicelli (40 baht). The noodles were cooked just right and well-seasoned. This was slightly sweetish (I think most Thai food are), spicy and fragrant from the liberal use of fish sauce. 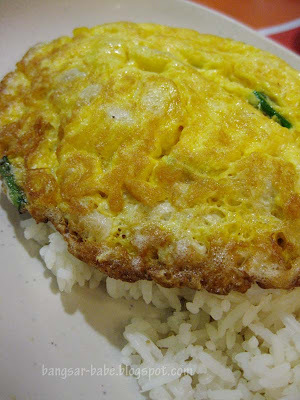 The omelette (40 baht) was bland, hard and dry, while the minced pork inside tasted like cardboard. A total disaster and a waste of money, this one. 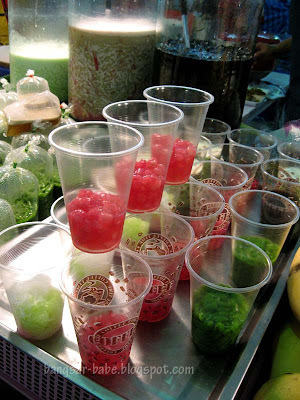 On the way back to the Skytrain station, we spotted a few vendors selling some Thai desserts. I bought the stuffed jackfruit (50 baht) and a cendol-like drink (20 baht) to try. 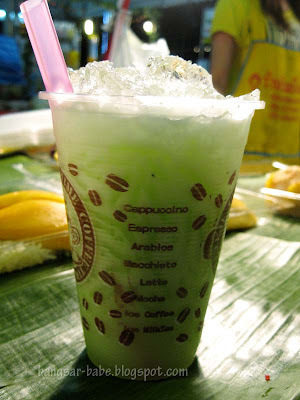 The drink was fragrant and creamy, but a tad too sweet for me. 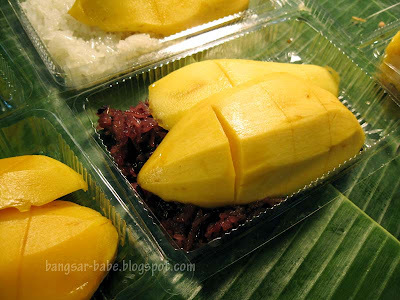 I didn’t like the stuffed jackfruit – it tasted very average and the glutinous rice was too dry. 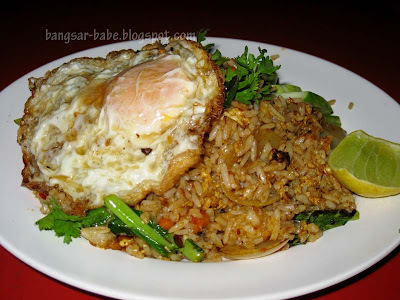 After a nice long massage, we shared a plate of spicy fried rice (50 baht,10 baht for fried egg) and tom yam kung for supper. I was very annoyed when the lady tried to rip me off. 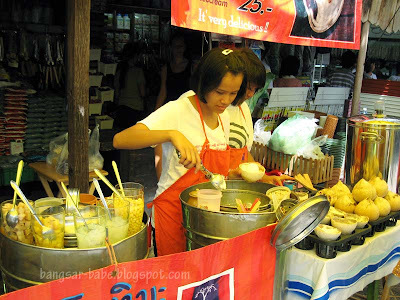 She charged me 90 baht for a bowl of tom yam kung, when I paid 80 baht for the same thing the night before. 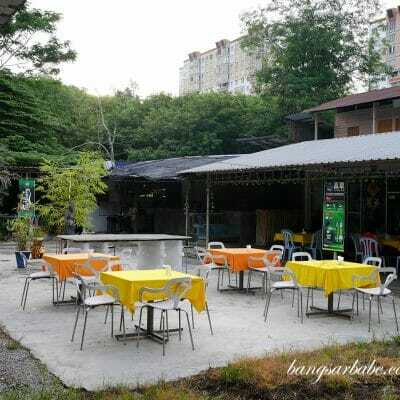 In general, I didn’t like Bangkok and found the people dishonest. I felt very ripped off, especially by the taxi drivers and food vendors. 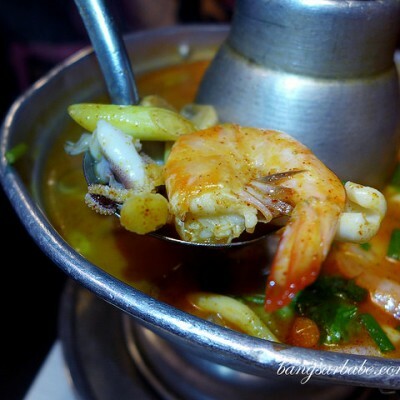 Come on, tom yam kung for 90 baht? 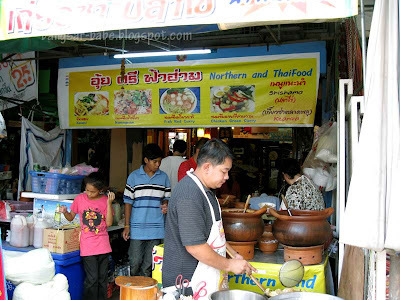 Pad thai (peasant food) for 50-70 baht?? 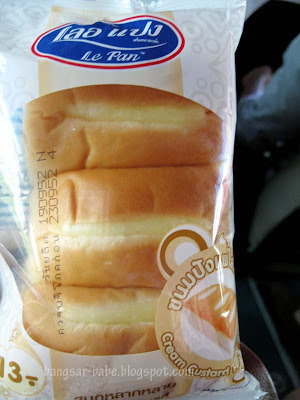 One of the few things I did like in Bangkok was the Cream Custard Bread from 7-11. Seriously, it’s darn good, and I ate it everyday. 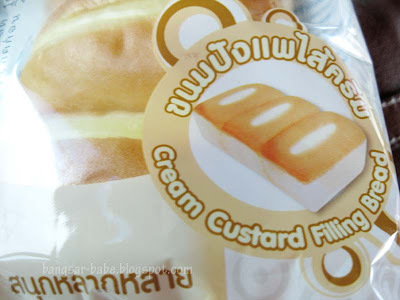 So if you happen to go to Bangkok, please buy me 2-3 packets ok? Chatuchak market… I went there twice.. yes, it's very hot but I managed to find stuff for my house (decoration items) last time I went there. In terms of clothing, like u said.. Platinum Mall is a better bet! I've forgotten how was Chatuchak like… Plan to go BKK next year! 🙂 @[email protected] was drooling at the food initially, but attention switched towards your purchases!! I wan i wan! ^^ I want to visit Platinum mall as well. doesnt sound like my holiday..
yes yes…agree! I made yearly pilgrimage to BKK, and each year it got worse. Very commercialized now. so sad. This human nature is present everywhere. I found more smiles and generousity when I ventured further afield. I remembered a toothless elderly lady in a poor eastern village in Buri Ram province (famous for their silk) pushing into my hands a silk scarf she handmade that she can sell for B1,000 in the marketplace. My only contribution was 2 days of volunteer work. I cried when I found out the price! Haha.. If you have to wear "M"size then probably I have to wear "XXXL". The shopping experience in Bangkok was a pretty wicked experience for us. Hot and humid yes, but the walking streets, night markets is what the experience is all about. it was almost a horrendous experience walking around chatuchak under the stuffy, hot and humid weather. 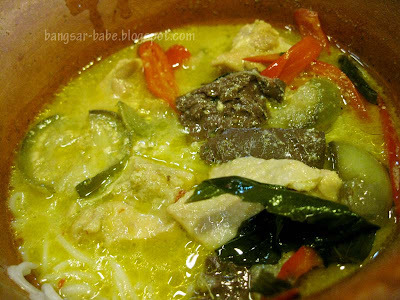 kampungboycitygal – Yup! I love that mall!! Unka – Raw?? No wonder so smelly! 0_o Hahahaha…serious ah? J2Kfm – Probably…I was sweating like a pig! 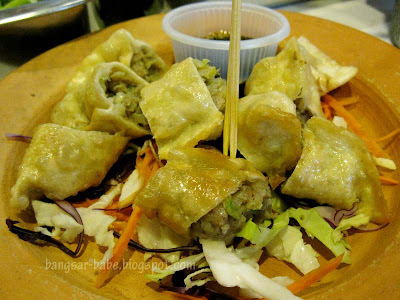 HoustonWok – If I were to go again, I'll go to the night markets. worldwindows – Wow! She's got a good heart…if only I encountered such people. nomad – Haih…all so money minded! Christine – Ya…go to Platinum Mall. Plenty of cheap clothes! It’s nothing to do with ‘ripping you off’. Thai people like to haggle, for everything. If you give in to the first price, you’re depriving them of their fun, but at least they get another 10 baht. And seriously, you’re complaining about a 1 ringgit difference? Bangkok is so much cheaper than KL you’ve probably saved that 100 times over just by spending some time there.